As everyone living in Bergen knows, it can rain a lot. Most people have probably wondered about how to get from one place to another as dry as possible. Do you get wetter when you walk or run? Figure 1: Shows the increasing wetness as time progresses. The person running collects more droplets from ahead while it continues raining the same amount upon both. For any given time, the person running gets wetter. To answer this question, lets start with a simple example and build an understanding for the problem. Imagine it is raining, you are standing still and there is no wind. You will only get wet from above unless you seek shelter or it stops raining. The situation changes if you start running, you will not only get wet from above but also from the front since you run into the rain drops ahead of you (Fig. 1). The fraction of rain that will hit the body within a certain amount of time is coloured in red and the rain’s direction relative to the body is indicated with the arrows. In this case, the faster you move forward the more raindrops you will collect. So, the faster you move, the more you get wet. Figure 2: Shows decreasing wetness with speed. 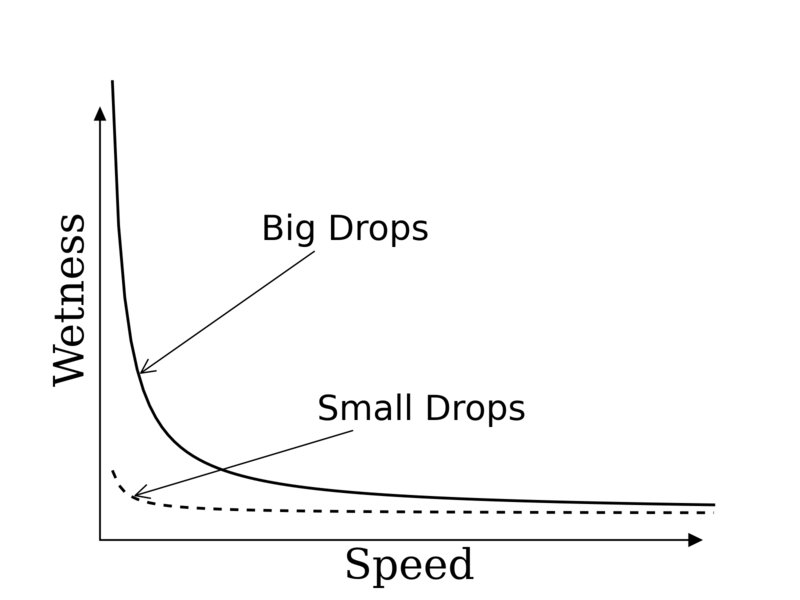 Different droplet sizes influence the falling speed and therefore determine how many droplets fall upon the person covering a certain distance. Since we usually want to get somewhere, standing still is obviously not an option. This is why we now consider a constant distance which we need to cover rather than investigating different speeds alone. But should you then walk or run? As I already mentioned, you will walk into the rain drops that are falling down in front of you as you start moving forward. At the same time, you will get wet from above. For simplicity let us now assume there is the same amount of raindrops everywhere. This means that for a certain distance you will collide with the same amount of droplets ahead no matter whether you walk or run. What becomes important now is the time you spend in the rain, since the only difference between running or walking comes from how long it rains upon you from above. The falling speed of the droplets determines how many raindrops hit you within a certain amount of time which again depends on the droplet size. A rule of thumb is that large raindrops (fall speed ≈ 10 m/s) are falling faster than small droplets (fall speed ≈ 1 m/s), hence larger raindrops can make you wetter. Thunderstorms, for instance, can produce large raindrops whereas drizzle usually consists of small droplets. For the calculations I assumed the same density for small and large drops. Therefore the only difference comes from the fall speed of the raindrops. In any case, the smartest thing is to spend as little time in the rain as possible, which leads to the advice: Take to your heels and run (Fig. 2). As always, life is just not that simple. We have not considered one more problem: wind. In this case, rain does not only come from above but also from the sides, front or back. The crucial thing to consider is the angle that the rain is hitting you. Figure 3: Note that in this figure the angle is variable while the speed is constant. The point where ”rain from behind” changes to ”rain from the front” is where you start to outrun droplets from behind and start collecting droplets from the front. The angle, at which the horizontal part of a certain wind speed is sufficiently small to make it possible to outrun the droplets, depends on your running speed. Changing the values for speed will change the figure. The chosen values are to demonstrate the concept that not always the fastest runner gets least wet and that it is smart to adjust your pace to a more suitable one. Wind with an angle from in-front or behind makes an important difference. Taking into account wind speed, direction and average running abilities, there is a perfect speed to get least wet. In Figure 3 we compare an average running speed with Usain Bolt’s super-human abilities. It becomes apparent that Mr. Bolt cannot always make use of his incredible speed. The other person, however, has a more appropriate running speed for some angles. It becomes clear that if the rain comes angled from behind, your running speed should match the horizontal part of the wind speed. In doing so, you will be fast enough to outrun the droplets coming from behind yet sufficiently slow that you will not collide with droplets that fall down in front of you. In case of head wind, you are again doomed to run as fast as you can and spend as little time in the rain as possible. If you do not think you can run fast enough, buy an umbrella as it will almost always be rainy in Bergen. 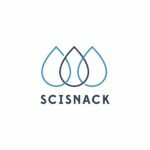 Hi, I am a PhD student at the Geophysical Institute, University of Bergen. My main research interests are extreme precipitation in the Himalaya region and how this might change in a changing climate. Apart from that, I am curious about all kinds of other things :). Tagged drier, dry, person, Precipitation, Rain, run, running, walk, wet, wetter.